Well....we did it!!! Our hiking, crawling, climbing, and swimming in search of ideal jaguar habitat and travel routes has paid off!! 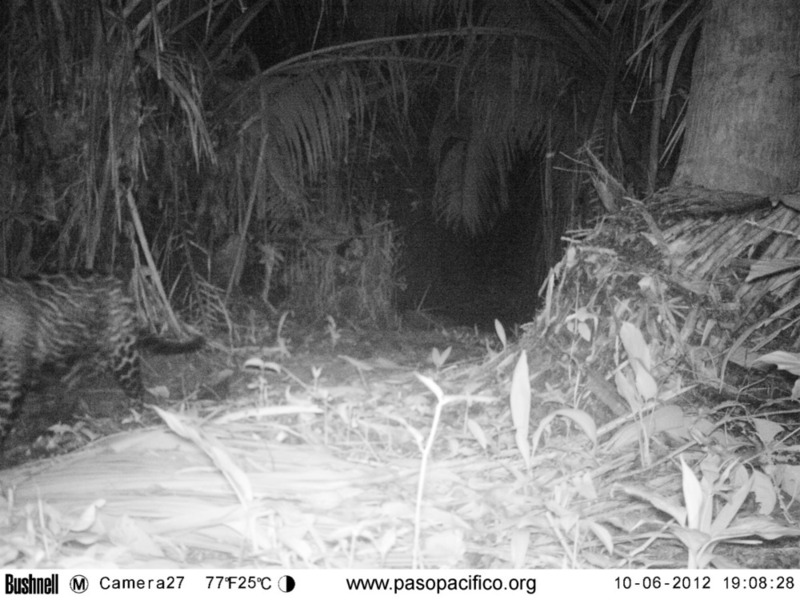 After 2 months of continuous sampling in the El Toro forest of Colon (southeastern end of our study area) we have photos of a jaguar!!! The photos may be a little blurry but couldn't be more beautiful and unmistakable. Marvin, our talented and hard-working field biologist, just returned from checking the cameras in the field. Kim (Director of Conservation Science at Paso Pacifico) greeted him in Managua and they eagerly skimmed through some of the photos to search for jaguars and other cool mammal photos. I was in southern California frequently checking my emails throughout the day while doing field work, hoping for good news. Of the 26 cameras that remain (1 destroyed, 3 stolen) we knew that this camera would be one of the first cameras that should be checked. We have high expectations for this camera location because we found jaguar prints on the game trail directly in front of the camera. Despite the recent killing of some jaguars in the Colon area these prints gave us hope that at least one and hopefully more would soon be discovered by our camera traps. Needless to say, our work is not done. There are more corridors to survey in the Paso del Istmo and many struggling wildlife populations still to discover. These jaguar photos along with future photos will prove that these corridors are very deserving and in need of conservation attention. Such attention would also benefit the struggling communities that share their backyards with these big cats. We would be able to teach them the economic, ecological and intrinsic values of a local jaguar population and how to coexist with these beautiful and important top predators. The largest cat in the western hemisphere is being put to the test but is managing to hang on in areas where they are seemingly on the brink of local extinction. However, it is uncertain how much more habitat loss and poaching the populations can endure. Camera trap research is one of many conservation efforts we owe to the resilient jaguar and Paso del Istmo of Nicaragua. This work would not be possible without the generous donations by the Los Angeles Zoo, U.S. Forest Service International Institute of Tropical Forestry, and generous people who care about the struggling wildlife and people of western Nicaragua. We have nearly exhausted the initial start up funds for our jaguar study. Please help us continue this important research by clicking here and donating. Thanks for continuing to follow my blog and my conservation efforts in Nicaragua and Los Angeles.